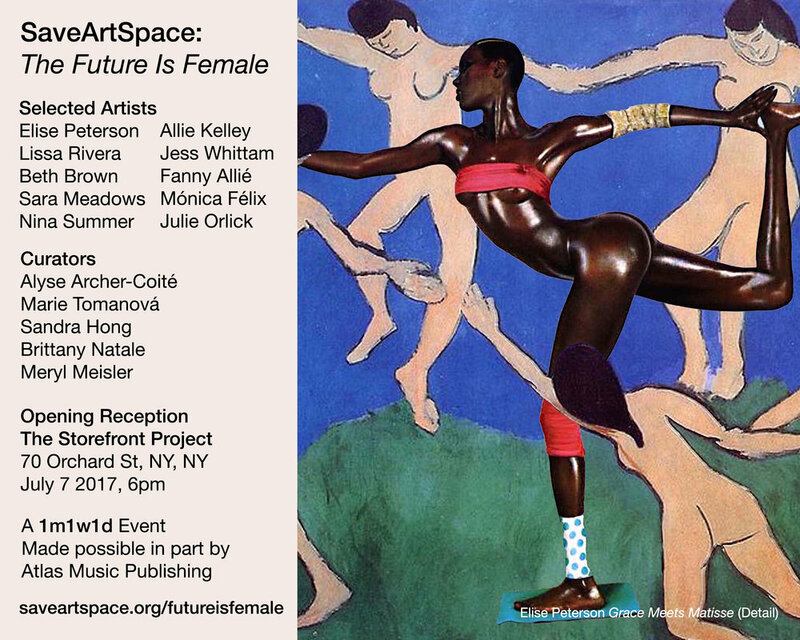 Brooklyn-based nonprofit organization SaveArtSpace is proud to present its latest initiative " SaveArtSpace: The Future Is Female" an all-woman gallery & public art exhibition. Inspired by today's feminist rallying cry which was first coined by the lesbian separatists of the 1970s, the exhibition aims to explore and celebrate the ever-evolving intersectional feminist movement, while redefining and expanding upon the mainstream definition of "the female gaze". The all-star curation panel of prominent visual art innovators -- Meryl Meisler , Marie Tomanova , Alyse Archer-Coité , Sandra Hong , and Brittany Natale -- selected works that reflect the multi-faceted reality of womanhood in the 21st century and expand upon society's traditionalidealsoffemininity.Theexhibitingartistsinclude AllieKelley ,B ethBrown , Elise Peterson , Fanny Allié , Jess Whittam , Julie Orlick , Lissa Rivera , Mónica Félix , Nina Summer , and Sara Meadows . Learn more about the curators and the exhibiting artists at saveartspace.org/futureisfemale. Founded by Travis Rix and Justin Aversano in 2015, SaveArtSpace is a non-profit organization that works to create an urban gallery experience, launching shows that address intersectional themes and foster a progressive message of social change. By placing culture over commercialism, SaveArtSpace aims to empower artists from all walks of life and inspire a new generation of young creatives. This event will be presented in partnership with 1m1w1d and Atlas Music Publishing .